Do You want to go Shelling? Ocean Isle Beach is not just about surf, sand & fun; shelling is also a popular activity! Did you know that OIB is home to shells like the Keyhole Sand Dollar & The Scotch Bonnet? If you’re a “professional” shell hunter, Ocean Isle Beach is the prime spot to go shelling! The best times to go shelling are before/after high tide, after a storm, late at night & early in the morning. Most beachcombers have found after hurricanes and tropical storms, that whole Sand Dollars & intact Whelk Shells are abundant on the beach. Shelling is an excellent way to get lost in a salad bar of shells while you look for that “special” treasure. When visiting Ocean Isle, the whole stretch of the island is public domain for you to search for shells, this goes from the water line to the edge of the dunes (please don’t climb on the dunes). It’s always best practice to collect only the shells you need, taking too many shells can hurt the ecosystem of the beach. Make sure to not take any live shells out of their habitat, please leave them at the beach. Finally, don’t go shelling on private property, keep on the public parts of the beach. You really don’t need equipment to go shelling, using your hands and a sand bucket can suffice. If you don’t want to bend down a lot, there are shell scoopers that you can buy at the many local beach shops! These scoopers pickup the shells and sift out the sand for you! Please don’t use plastic bags, they can get away from you and blow into the ocean, harming the wildlife. 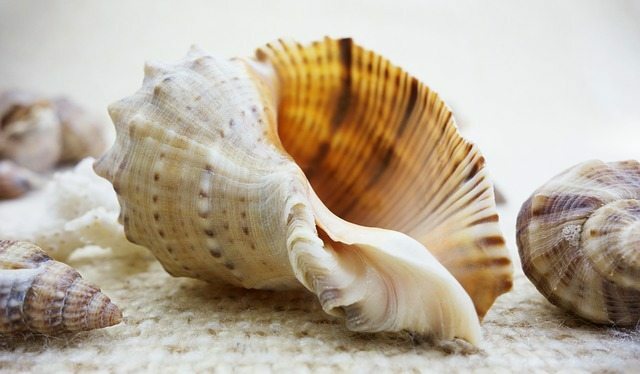 Want to add to your shell collection from Ocean Isle Beach? You’re in luck, the Islander Inn can accommodate you! Call us at 1.888.325.4753 or book a room online today! We have Oceanfront rooms available, thus giving you the perfect location to scope out your shell collecting territory!